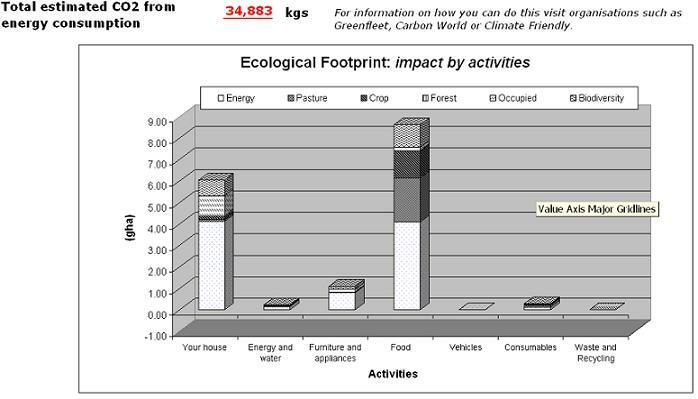 Following on from my blog yesterday I used an Ecological Footprint calculator calculator to derive what I consider to be a more accurate portrayal of total energy use. Remember how I felt that our calculations of carbon emissions fell way short of what I considered to be a realistic portrayal? The calculators we used only took into account the energy we directly consumed via cooking, heating, driving, cooling, etc. It left out the energy that went into the production of everything we consumed. 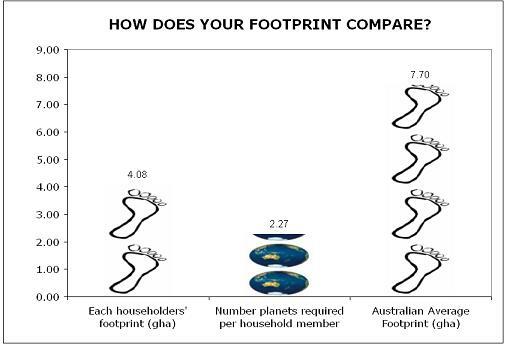 The calculator on the Ecological Footprint website allowed us to obtain a more accurate representation, as well as comparing our emissions to that of the 'average' Australia and the rest of the world. One of the measurements used is a gha - global hectare. A global hectare refers to one hectare (approximately soccer field size) of biologically productive space with world-average productivity. The level of what the planet can regenerate on an annual basis is the equivalent of about 1.8 global hectares per person per year. According to the website, the average Victorian needs 8.1 global hectares of land to sustain his or her lifestyle. If everyone on the planet lived like Victorians, we would need more than four Earths to support us. Multiply that by 4 (as there's 4 adults living here) and you get 32.4gha. Not bad, but not good either. That's still over 7 soccer fields each... That's far too much land and energy to sustain four adults. We will need to reduce our gha by half - from 4 to just under 2 - to become sustainable. In order	to reduce our footprint to 10gha, or 2.5gha per person, or 23,183kg of carbon dioxide emissions (23.1 tons) I calculated that we would need to cut our meat bill to $2 per person per week, no diary, $10per week per person on fruit and vegies (grow our own basically), and spend $1 a week on grain foods per person each week - bake our own bread, etc. We would spend $4 per week on clothing and shoes each, and $0.50c each on books, magazines, etc. Is this achievable? Hmmm. low pressure water means reduced amount of water used in shower and when taps are turned on. 3 minutes showers only use 16 litres of water at this rate. recycle printer/toner cartridges, computer parts etc. With luck and careful consideration hopefully by the end of the year I'll be able to report that we've cut our emissions and ecological footprint in half!